One of Donald Trump’s signature campaign promises was that he would build a wall along the U.S.-Mexico border and that he would force Mexico to pay for it. At one campaign rally after another, Trump spooked his fan base with tall tales of people flooding across the border at alarming rates even though illegal crossing had fallen to historically low numbers. “Build that wall!” his legions of fans would chant at the campaign rallies, enthusiastic that Mexico would bear the cost of building the wall to keep their own people out of the U.S., a theory that didn’t seem at all odd to them. “Mexico will pay for it, believe me!” Trump promised as he revved up the already enthusiastic crowds. But no sooner had Trump won the election when he started to recast his promise to build the wall and make Mexico “reimburse” the U.S. for it, then it turned into Mexico will eventually pay for the wall. 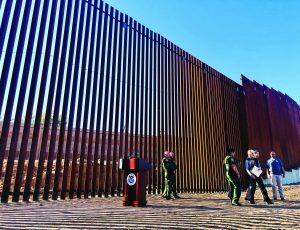 Of course, Mexico’s President and several other officials scoffed at the idea that they would pay for the wall as absurd and foolish, with Mexico’s former President Vicente Fox saying the idea was just part of Trump’s “stupidity”. Never deterred, Trump then began demanding up to $30 billion in the U.S. budget to pay for the wall, completely abandoning the promise of Mexico paying for it. Last year, Trump forced the Department of Homeland Security (DHS) to fund eight wall prototype models near the San Diego border. Trump even came to town to inspect the 30-foot tall monuments. Border experts, however, suggested that the money would be better spent on fencing, monitors, and staffing. Trump didn’t listen. Over the past two years, as the Republican-controlled Congress failed to provide the billions of dollars Trump demanded for the wall, he has again shifted his stance to say that Mexico will pay for the wall indirectly through the newly negotiated amendments to NAFTA, now known as the USMCA, or the U.S., Mexico, Canada Agreement. That argument would suggest that any improvements in trade relations will result in higher profits for American companies and theoretically higher tax revenues for the U.S. Treasury which would then compensate for the costs of the wall. Trickle down economics at its worst. Two weeks ago, our government was again facing a funding deadline because (again) a federal budget hasn’t been approved and the short-term funding called Continuing Resolutions would finally run out on December 21st. Although the Senate passed a budget bill that would have funded the government through Feb. 2, the House gave into Trump’s demands and included $5 billion for construction of the border wall. As expected, House Democrats refused to vote for it. Then, the federal government shut down, at least partially. Over 400,000 federal employees and contractors have now been off work with no pay since before Christmas, and there’s no end in sight. The Smithsonian Museums, D.C.’s National Zoo, and Yosemite are now closed. The problem isn’t border security, it’s pure politics. Democrats have voted for including up to $1.6 billion for border security but not the wall. The funding is equal to the amount that was in last year’s budget, but that’s still not good enough for Trump. With Democrats taking over leadership of the House this week with their new majority, Trump’s demands for billions to fund the wall surely will fall flat. Democrats know the wall is just a political game for Trump and they don’t seem likely to give in. In the past two weeks, it seems even Trump may be unsure what he really wants. His demands have always been for a “beautiful wall” across the entire length of the border, but recently he’s sprinkled in calls for a fence, barrier, and even barbed wire as the military recently deployed when the caravan of migrants was approaching Tijuana. Last week, his outgoing Chief of Staff, John Kelly, said that the concept of a solid concrete wall was abandoned early in Trump’s administration after talking with Border Patrol leaders that actually know what’s really needed along the border. Trump quickly tweeted that Kelly was wrong, the concrete wall was never abandoned, Trump said. But then last week, Trump send out messages saying he has already signed a contract to build 110 miles of the wall, and that construction had already begun on sections of it. One problem. DHS says no contracts have been signed, and that only repairs of existing fencing have been completed or are ongoing. No wall. Does Trump want a wall, a fence, or a barrier? Is Mexico going to pay for it, now or later or never? Does Trump want the money in the budget so badly that he’s willing to shut down the government, or does he already have the money and he’s signing contracts? It doesn’t seem to matter much to his fan base anyways. In two years in office, Trump has not accomplished as much as he claims he has, outside of cutting taxes for the rich and ballooning the national debt. To be fair, he’s also abandoned environmental regulations and trade treaties. He’s made it harder to get health insurance. He’s rattled the stock market and caused the worst December for stocks since the Great Depression in 1931. But, through it all, his fan base remains unfazed. They argue that Trump is fighting the system and draining the swamp. Strangely, they still dismiss the dozens of indictments and plea deals of Trump associates as a witch hunt. And they stick by their red hat wearing Commander in Chief no matter what. In the end, Trump’s calls for a wall may be exactly what he imagined: an impregnable barrier to keep people apart in an irreparable way. The problem is that the people he’s separating are Americans that agree with him from those that disagree. He’s not making the country safer; he’s only make it angrier, more divided, and less American. Hopefully, this new year will bring about a renewed sense of cooperation in Washington, D.C. to get things done, with real solutions to the pressing problems that have gone unsolved for too long. Immigration is chief among them. DACA. Amnesty. Unaccompanied minors living in detention centers. Real border security. Trade. Trump has an opportunity to set a new tone going into his re-election, or to continue to pick fights and focus solely on pleasing his shrinking base. When Trump met with congressional leaders on Wednesday this week, he said he couldn’t accept a compromise on funding for the wall because he “would look foolish” if he did. Unfortunately, so far from the first few days of this year, it looks much the same as last year.